Above Photo: The Food Project, which creates personal and social change through sustainable agriculture, has leased land from the DSNI community land trust for urban farming since 1995. Pictured are Kesiah Bascom, Jonathan Aldieri, and Danielle Andrews. Photo by Paul Dunn. Tony Hernandez remembers playing as a child on the vacant lots in the Dudley Street neighborhood of Boston. In the 1980s, white flight and disinvestment had so devastated this neighborhood that more than 20 percent of the land—1,300 lots—lay vacant. Today, Hernandez owns a home on this land, one of 225 units of permanently affordable housing. His home is surrounded by parks and gardens, a town common, community center, charter school, community greenhouse, and several urban farms. This transformation was led by residents of the Dudley Street Neighborhood Initiative, who in the late 1980s established a community land trust to take democratic ownership of the land and guide development. A community land trust (CLT) is a nonprofit organization governed by community members that stewards land for long-term public benefit. CLTs protect land from the pressures of the real estate market, as the land is never resold. It remains part of the commons. Under private ownership, land tends to go to the highest bidder and toward uses intended to generate the greatest market return. Cities have an incentive to build up the market value of land, as they rely so heavily on property taxes to fund schools and other services. That explains why too often high-end condos are preferred by developers and cities over affordable homes or urban farms. Though vacant land was plentiful and inexpensive in Dudley in the 1980s, residents were concerned not just about revitalization but also the city’s redevelopment plans to gentrify the area into hotels and offices serving downtown Boston. Not only did they succeed in pressuring the city to adopt the community’s plan, they also won the right to use the city’s power of eminent domain in a 60-acre core area to take blighted land from private owners and redevelop it. The Dudley land trust, then, would own the land and realize a vision of development without displacement. Hernandez has lived on the Dudley land trust for the past 12 years with his school-age daughter. He points out that with an affordable mortgage, “I was able to complete my master’s degree in architecture and even set up a college savings account for my daughter. I felt secure, even with foreclosures happening left and right.” Indeed, a 2011 study of foreclosures on CLT housing found that only 0.46 percent of CLT owners were in foreclosure proceedings compared to 4.63 percent in the conventional market. These low rates are attributable not just to affordability but to the CLT’s role in working with both the homeowner and banks to address issues as they arise. Although the market value of homes in Boston has skyrocketed in recent years, Hernandez says he “can’t flip the home,” as the resale price is restricted to a one-half percent increase per year, capped at 5 percent after 10 years. He explains, “The purpose is to cap it so that affordability can be extended to another family.” This continuing affordability is made possible because the land trust owns the land and leases it to the homeowner, who owns only the housing structure. Though housing was its first priority, Dudley Street has also pioneered the use of the land trust for community and economic development, most notably urban farming. Urban agriculture has taken off in many cities as a way to improve health and access to local produce as well as to put vacant land back into productive use. Dudley Street built a community greenhouse in 2004 on the site of an abandoned auto garage. They also lease land to the nonprofit Food Project, which runs farms as youth development enterprises. Despite these successes and Boston’s recent legalization of commercial farming, the challenge of acquiring land still remains. 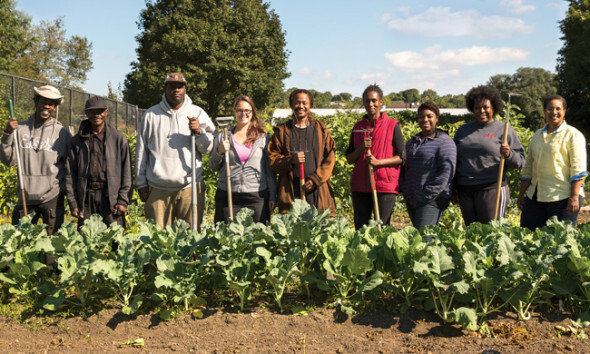 According to Glynn Lloyd, co-founder of City Growers, a for-profit farming venture in Boston, “There are so many competing uses for vacant land that its market value makes it unaffordable for farmers.” City Growers currently farms four sites in Roxbury and Dorchester, two adjoining lower income neighborhoods of color that include the Dudley neighborhood. Meanwhile, the ranks of future farmers grow. The nonprofit Urban Farming Institute of Boston (UFIB) graduated seven farmers from its training program last year, four of whom are now apprenticing with City Growers. Eight more are completing the program this year. “Amassing land for our farmers is a first priority,” says Executive Director Patricia Spence. That is why they have teamed up with several partners to develop three new farms that will be owned by the Dudley land trust. In July, ground was broken on the first of these in Roxbury, the Garrison Trotter farm, named after abolitionist William Lloyd Garrison and civil rights activist William Monroe Trotter. The nonprofit Urban Farming Institute of Boston graduated seven farmers from its training program last year. Eight more are graduating this year. “Amassing land for our farm is a first priority,” says Executive Director Patricia Spence, far right. Photo by Paul Dunn. Durham, N.C. Durham Community Land Trustees was formed in 1987 to clean up abandoned homes that were attracting crime and to increase homeownership. Today, they have 200 units of housing and a community garden. Madison, Wis. Founded in 1991, the Madison Area Community Land Trust has 68 homes. In 2001, they purchased the 31-acre Troy Gardens, on which they developed 30 units of mixed income housing, 10 acres of agriculture (including a CSA and community gardens), and 5 acres of restored prairie. Albuquerque, N.M. The Sawmill Community Land Trust developed 27 acres into “Arbolera de Vida,” a whole neighborhood with 93 affordable ownership homes, three apartment buildings, a playground, a plaza, and community gardens. As compelling as the previous cases are, CLTs are still at small scale. Many of the previous examples are in areas where the real estate market has heated up, raising concerns about gentrification. But how might CLTs work in cities with vast amounts of vacant land and a depressed real estate market, such as Detroit? Eric Holt-Giménez, Executive Director of Food First/Institute for Food and Development Policy, views the Hantz project as “creating wealth by appreciating real estate rather than creating value through productive activities.” Indeed, Hantz’s initial proposal to grow vegetables and fruit was changed to a tree farm when it became clear that farming produce was not feasible as a commercial operation. In Philadelphia the story of a group trying to hold onto land they had been farming for more than 50 years also highlights the clash between commoditization of land and community interests. It points to a potential solution—a land bank—for scaling up the implementation of CLTs. Philadelphia has a thriving urban agriculture movement and recently passed an urban agricultural ordinance. The Central Club for Boys and Girls started gardening on vacant parcels of land in their neighborhood in the mid20th century, eventually taking over an entire city block. That Central Club held no legal rights to the land became evident in 2005, when two of the parcels they were farming were sold by the city to recover back taxes. In 2011, another two parcels were put up for sale. Central Club eventually won ownership of the land, but it required intensive legal support from the Garden Justice Legal Initiative of the Public Interest Law Center of Philadelphia. In 2011, a coalition of community, labor, and faith groups formed the Campaign to Take Back Vacant Land to enable more community control over the city’s 40,000 vacant parcels and prevent the challenges that Central Club faced. They proposed establishing a city land bank that could assemble and manage vacant properties and prepare them for transfer to local CLTs. In January 2014, the Campaign and the Philly Land Bank Alliance won passage of a city ordinance establishing a land bank. The bank will be the single owner of the city’s vacant properties, with a transparent and equitable process for managing and selling city-owned vacant land. It will clear land titles of any back taxes and liens. Most importantly, four of the 11 land bank board members will represent communities, and the land bank must “weigh community benefit, and not just price, when deciding between potential buyers.” If successful, the land bank could be a significant new source of land for CLTs. Whether the goal is affordability when real estate prices are high or community control over development when land is cheap, the community land trust has shown itself to be a potent tool. Across the country, communities are using this form of ownership to make collective decisions about a common good—the land. In a way the CLT is a return to more traditional and indigenous ideas about land as commons—that it cannot be owned solely for individual benefit.